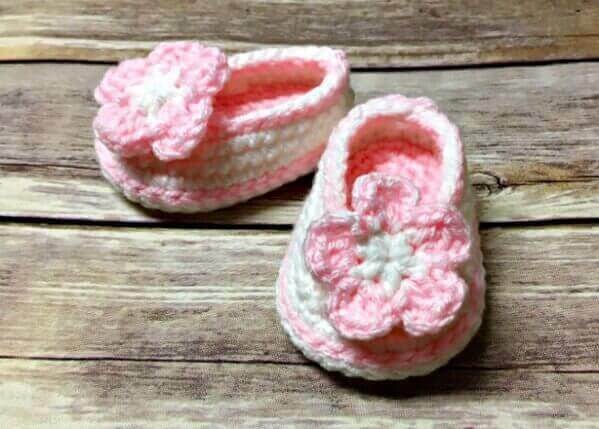 Today I am welcoming Amanda from amandasaladin.com to the blog to share her adorable little baby booties crochet pattern!! Aren’t they precious!?! Be sure to pop over to her blog or social media to show her some love and give her a big thanks for the free pattern. Hi everyone! My name is Amanda and I am so excited to be guest posting today on Petals to Picots. Spring is in the air in Middle TN and I have been dreaming of flowers and warm, sunny days. 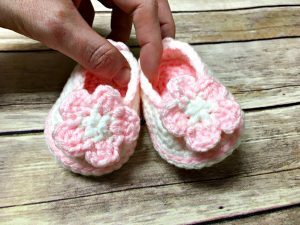 Baby items have long been a favorite of mine and for this special post I designed a sweet little pair of baby booties. For those of you that don’t know me, I blog at amandasaladin.com, where I share free crochet and knitting patterns and tutorials. I am mom to three amazing little boys (all under the age of 8! ), wife to a wonderful hubby, and a high school teacher. I have a BS degree in Fashion Design but didn’t put my love of yarn with my love of designing until about 5 years ago. I haven’t looked back since. This pattern was such a joy to create – can’t you just see the sweet Spring blooms? 2 dc cluster: Yo, insert hook into ch-1 space, yo, draw up a loop, yo, draw through two loops on hook (2 loops on hook), yo, insert hook into same ch-1 space, yo, draw up a loop, yo, draw through 2 loops on hook (3 loops on hook), yo, pull through remaining loops. Round 4: Join CC, slip st 9 (11), hdc2tog, dc3tog 2 times, hdc2tog, slip st to end. With MC, make a magic ring. Round 1: Ch 2, (sc, ch1) four times, sc, join with slip st to 2nd ch of t-ch. Round 2: Change to CC, slip st to first sc, *ch 3, 2 dc cluster in ch-1 space, ch 3, slip stitch in sc (one petal made); repeat from * four times for five total petals. Sew flowers onto booties as shown in photos. Weave in ends. That’s it! I really hope you’ve enjoyed this free pattern. You can check out more of my free baby patterns here. Why can’t I print friendly version?? Hmmm … I’m not sure why. It is working fine for me. 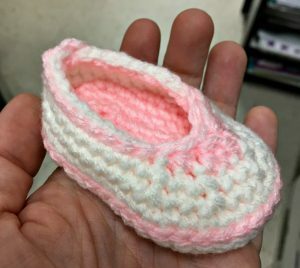 Hello, habe gerade die niedlichen Babyschuhe entdeckt. Muss ich sofort einmal ausprobieren.